Scan Your Twitter Followers to Detect Spammers. Home Web Scan Your Twitter Followers to Detect Spammers. Twitter became the fastest-growing social media site and so it also became a prime target for Internet spammers.TwitBlock is a junk filter and bulk blocking tool for Twitter users.Twitblock is the online service which allows users to scan their twitter followers for suspicious behavior like ignore factor, follow rate, identical profile pics and ask user to block spammers. 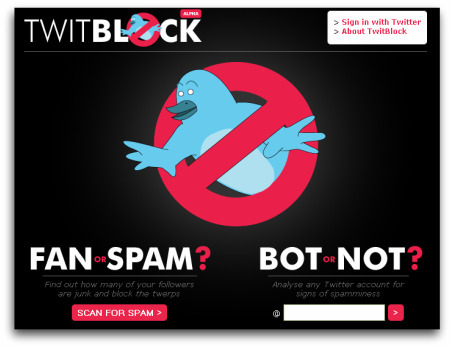 Twitblock allows you to scan your Twitter account for detecting spammers and block them. And also you can analyze any account to determine whether it is spam or not. You may think you have a loyal following of people who find you interesting, or amusing, but they’re probably not all real people. Among your followers will be a wide spectrum of fully automated, or computer aided Twitter accounts. They will range from reputable companies looking to profile and market to you, to fake profiles directing you to adult websites. Even you can check an individual profile if he/she is spamming or not.Give the follower scan a whirl and you can block your spammiest followers in one fell swoop. Copy & Share Documents with your camera phone or Digital Camera! Interesting Facts And Tips for Wordpress!